Holly the bear suffered for 15 long years before someone came to her aid. Like so many performing animals, Holly was snatched away from her mother, who had been killed by poachers. She was then sold into the exotic pet trade, designated for use as a dancing bear - a crude, antiquated practice where bears "dance" for tourists. To force the little cub to perform, her owner pierced her muzzle with a burning hot rod and shoved a rope through it - he could then control her movements to make her "dance." He smashed her teeth with a rusty hammer, leaving her mouth with open wounds that attracted maggots. "Every day Holly was beaten and starved into submission and quickly learnt to obey her handler simply to avoid being hurt," International Animal Rescue, one of the groups that helped save her, wrote on its website. "The pain must have been excruciating." For the next decade and a half, Holly lived on the hot streets of India, being forced to perform and make money for her owner. But finally, help came. In 2003, Holly was rescued from the life of pain and transferred to a sanctuary run by Wildlife SOS, where she was treated for her injuries. 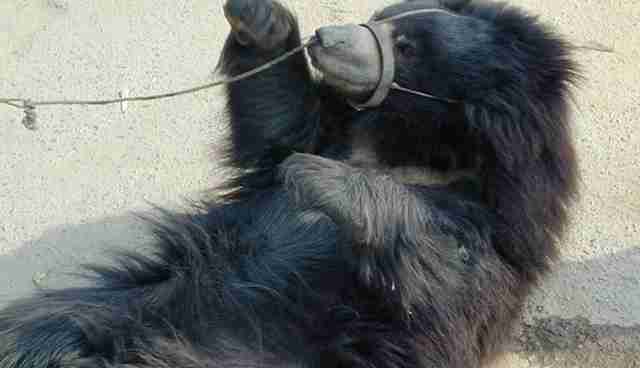 According to Wildlife SOS, which also organized the rescue, there were an estimated 1,200 dancing bears in India in 1996, when Holly was still captive. 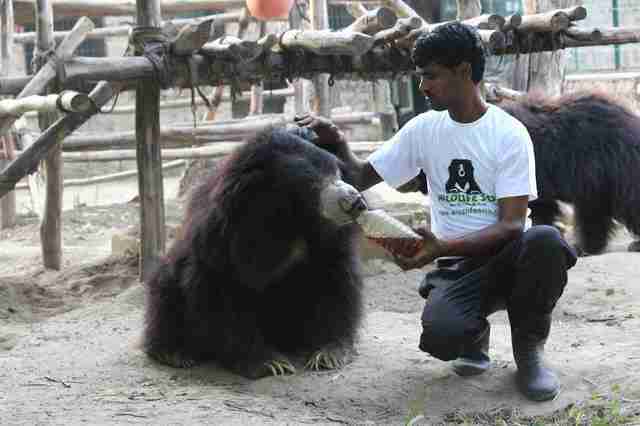 Along with Holly, Wildlife SOS and IAR rescued more than 600 sloth bears, cracking down on the dancing bear industry and moving the victims to sanctuaries where they're "enjoying a life where they'll never again have to endure such cruelty and pain," Wildlife SOS said on its website. The last dancing bear rescue was in 2009, but the fight isn't over. Sloth bears are still threatened by poaching, with some of the stolen babies being smuggled into the dying dancing bear industry, killed or captured to be used in Chinese traditional medicine or butchered for meat. 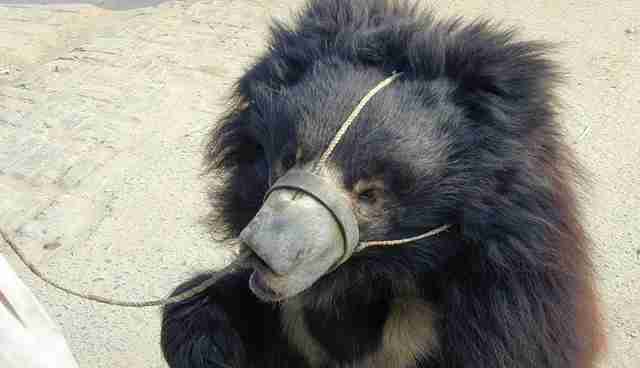 Holly got out, but she bears the scars of what a lifetime in the sloth bear trade can do. 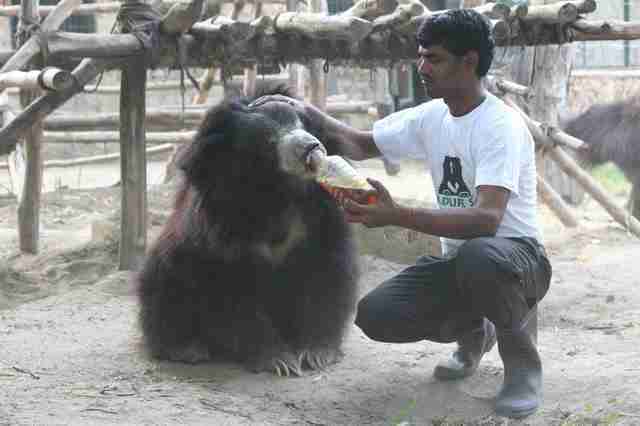 Now 27 years old, she's the oldest bear at Wildlife SOS' Agra Bear Rescue Facility. Her life at a sanctuary is miles away from the torture she experienced as a dancing bear, but it's not the life she was meant for. She has weak joints and is on medication, and has trouble seeing, so workers have to guide her to her food. But she has survived. She's also found solace in the company of a much kinder sort of human. "She has a strong bond with her keeper," Suvidha Bhatnagar, PR representative for Wildlife SOS, said in an email. "Most of the times, her keeper sits with her while she finishes her meal." Photos of Holly with her new keeper, as he leans down to gently help her feed, stand in stark contrast to the photos of her before her rescue. "Holly is one of the lucky ones," IAR said. 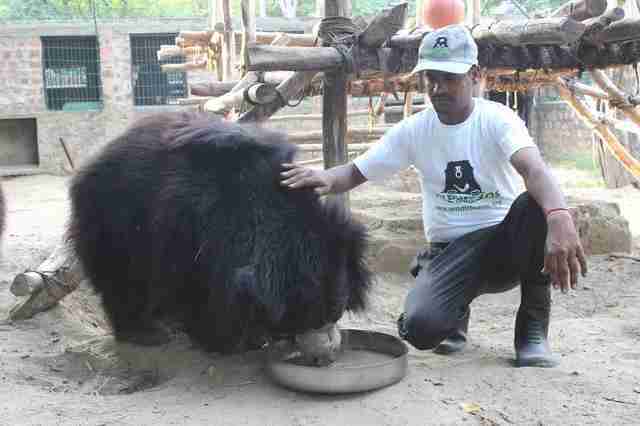 IAR and Wildlife SOS continue to provide sanctuary for Holly and the other rescued bears as they work to stop the sloth bear industry for good. You can make a donation here if you'd like to help them.